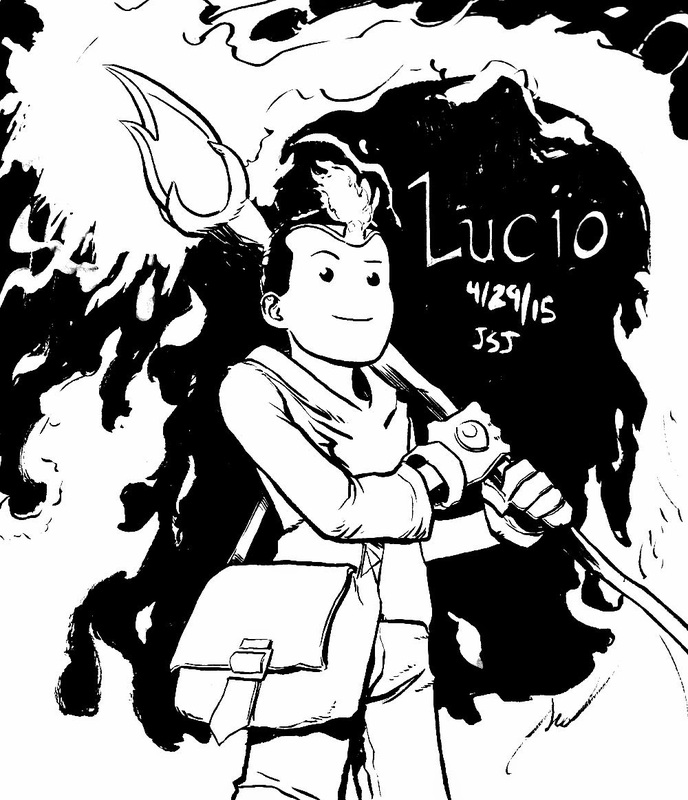 L is for Lucio, one of the heroes of my short all ages comic: Rare Drops! Lucio is a young mage who wants to be known as a great wizard. He and his partner Arya adventure around the world, seeking rare treasures and hoping to become better warriors and have fun in the process. Rare Drops is sort of my love letter to fantasy and rpg games I used to play as a kid. I used to love putting the game away and then going outside to adventure on my own, so Rare Drops was a chance to rekindle that magic. If you'd like to read the first book of Rare Drops, you can find it HERE! The book is also for sale in my shop for just $5 HERE! K is for Kal, the A-Z character thingy goes on. I'm still having fun so that's good. Kalypso is a Dominican woman who has led a hard life. She found herself learning Muay Thai to defend herself, but soon became enamored with the art. After leaving her home and her troubles behind, she and her lover started their own Muay Thai gym where she teaches others, men and women, how to defend themselves and to push themselves further than before. 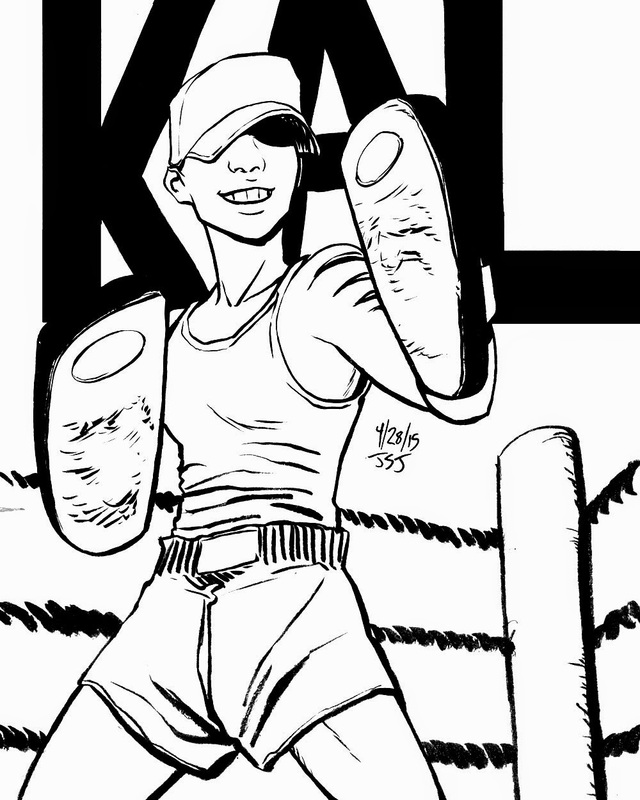 Kal is a tough woman and is a fighter who has earned the tiger stripe tattoos on her back and arms. These drawings of characters who haven't been drawn in comics yet are so much fun. I haven't yet started the drawings for this story, so a lot of the character designs are sort of floating around in my head. Drawing them like this makes them more solid and I can now better imagine her in the story. I hope you'll enjoy it when I draw it! 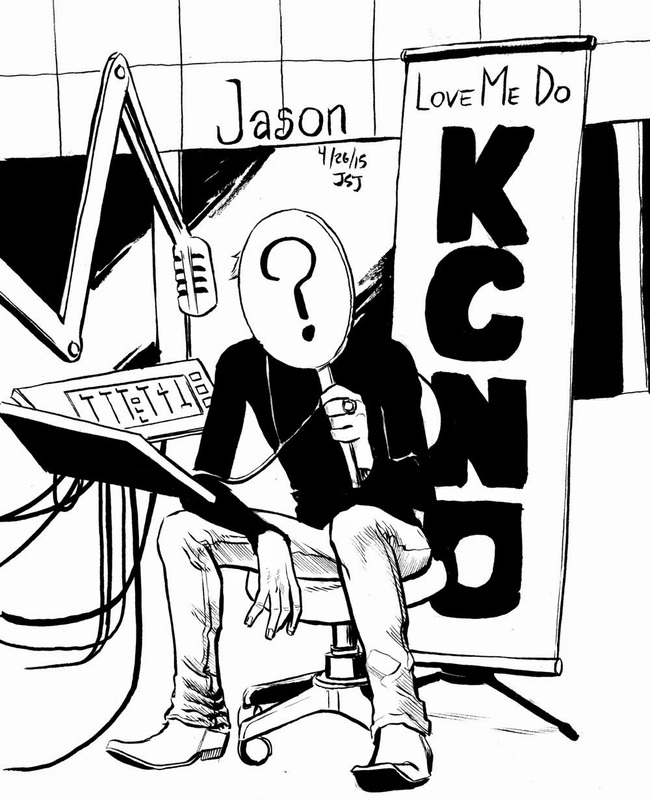 J is for Jason, from KCNO. If Irene is one of my favorite characters, she rivals or shares the top spot with Jason. Jason has an extremely popular radio show in his town. Love Me Do is a hit with people of all ages and Jason is known for giving solid advice on love, life, pretty much anything callers have a problem with, Jason can help them. His voice has brought many people joy, but then the people began to wonder who Jason is. What does he look like? Why doesn't he attend events? Why is this man that they love so much an enigma, and why does he want to keep it that way? If you'd like to read KCNO, you can find it here: KCNO. KCNO is one of my most well received books, it's the only one I can think of that has actually made people cry, and it's one of the books I think I've done some of my best comic work on. The art is dated, but in terms of storytelling and layering and everything else, it's the book I'm probably most proud of. If you read it, I hope you enjoy! Comment to say what you think if you give it a read! I is for Irene! I've been excited to revisit Irene, she's one of my favorite characters if not my favorite. 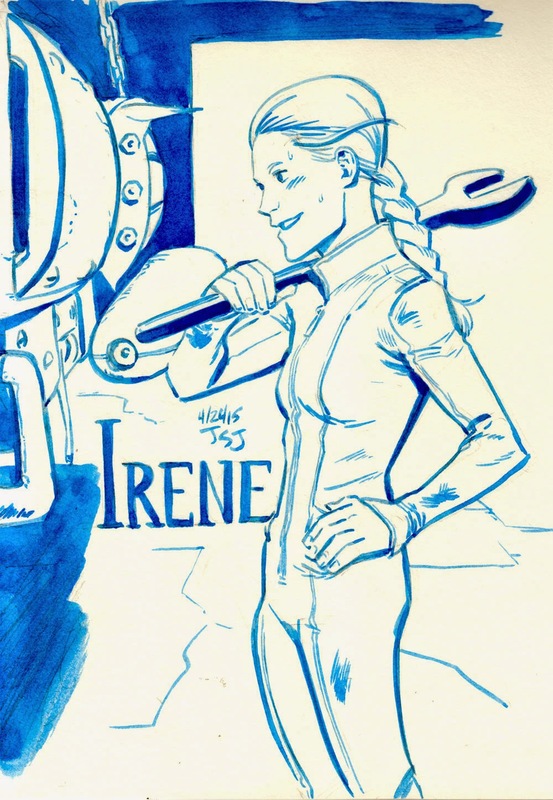 Irene is young mechanic and pilot whose dream since childhood has been soar in the skies. She both makes and flies these machines called Aerodynes which are sorta like speeder bikes but they can go to much higher altitudes than a few feet above the ground. However, the regent of her nation has declared that Irene is not eligible to get her pilot's license because of her family past. She challenges this decree and is given the chance to earn her license...if she can beat 5 of the Academy's top pilots in her age group in aerial paintball combat. If you'd like to read that first book, click HERE! I still have a couple of copies in my store, so if you'd like to snag a copy, do so soon. I maybe have 2 copies left and am unsure when I can print more. 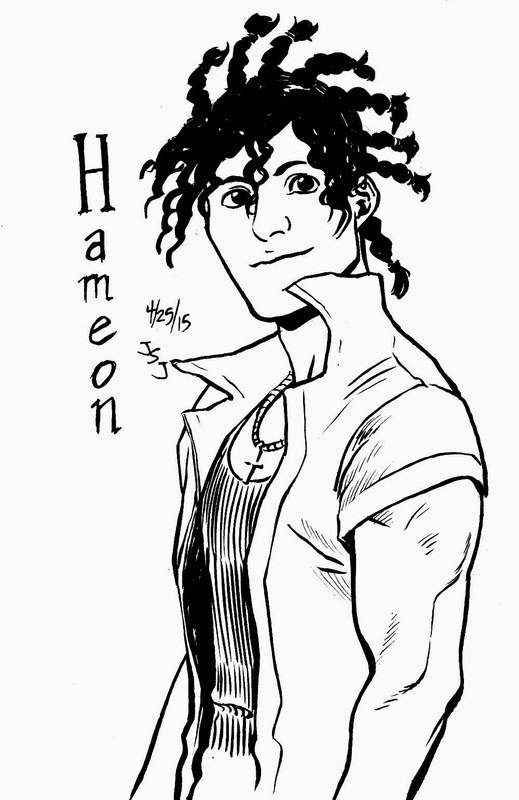 H is for Hameon, another vampire from my old webcomic, The Wolves of Sariel. If you're feeling like looking thru some cringe-worthy old comics, it's still out there on Smackjeeves. Hameon was an orphan child who caught the attention of the Wolves of Sariel. he was quickly brought into their coven where he finally had a family. Hameon was a cheerful guy but wouldn't ever question the violence of his life or of his family's "business." As the story went on, Hameon becomes a much more important figure, becoming the center of a war between the religious Wolves of Sariel and the anarchic Crusaders. I didn't get to draw all of his story, but it would be fun to get to one day. 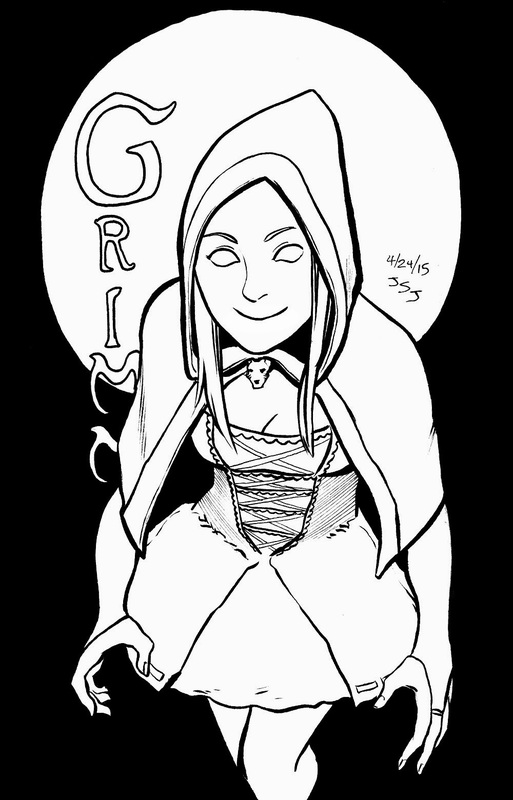 G is for Grimm, Lady Grimm. 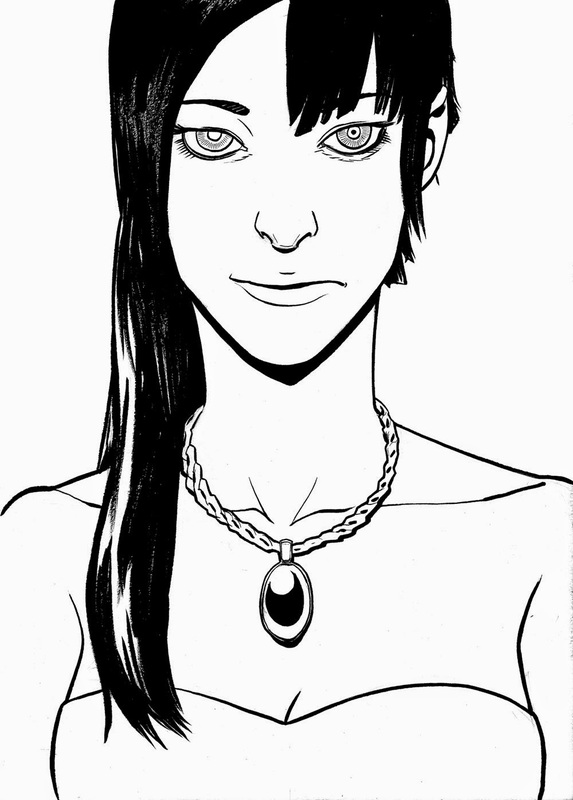 She's a character from my magical woman comic, Good Night Mrs Goose that I worked on from about 2009 to 2011. Grimm is a young witch who finds life to be boring. She yearns for the times of old, when magic had more presence in our life. So she and a group of other witches begin to bring storybook creatures into the real world, hoping to slowly saturate it and bring magic back to its rightful place of glory. Only Mother Goose stands in their way, but I never really got around to drawing most of that! I took a hiatus from it while I was working on my Master's degree, and never picked it back up. Mainly because my art style changed pretty dramatically. 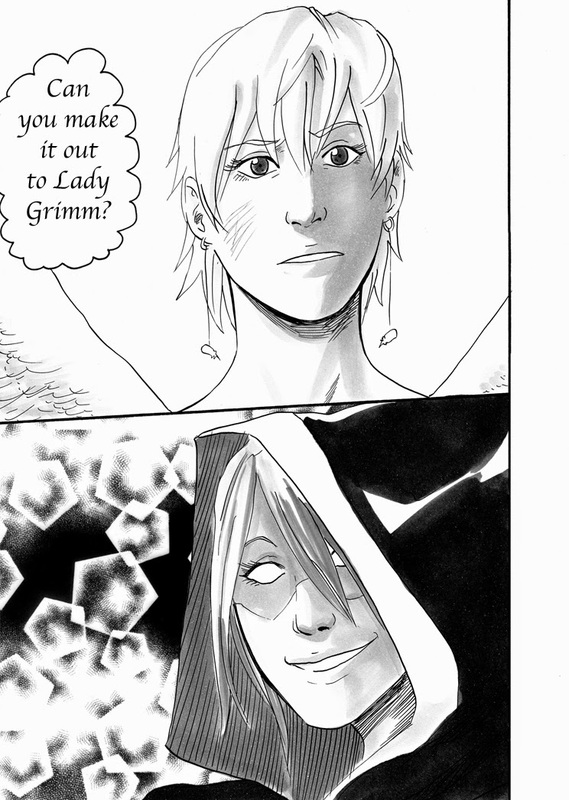 Here's a sample of Grimm from 2011. I'd like to return to Goose one day, I still really like the premise and I think it's almost even a better fit to come out now than it was for the time. But alas, for now it must remain in my cache of ideas to one day get to. F is for Frey! Another character from my series Wolves of Sariel. Frey was a Mexican American man who became a very important member of the Wolves, which is the same group of psuedo-religious vampires that Delilah was a part of. Unlike Delilah though, Frey saw the importance of having an organization as he knew that power is often the only language that people can understand. A potent boxer before he was turned, Frey's existence on the streets made people think twice about crossing the line into evil, and his use of a bizarre object to create white flame meant that every body he left behind was a torch to remind people that he was out there looking out for good people. Unfortunately I didn't get to draw all of the most interesting scenes of him, but maybe one day I will. 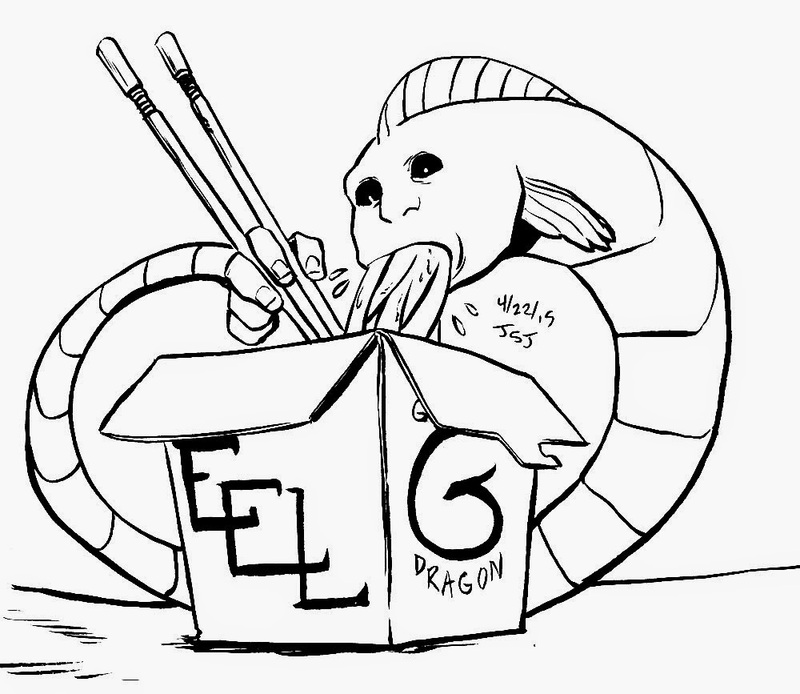 E is for Eel! THE Eel! he's from my book, "Curse of the Eel." The Eel is a creature much like Cthulhu, from a plane of existence that couldn't possibly exist, and the Eel defies comprehension. Unfortunately for Connie, who hoped it would be a monster like Cthulhu and start driving people mad, it'd rather help her solve her problems and get some tasty earth food. It's a fun buddy comedy with a Goth girl and her Eel creature who is really more down to earth and calm than she is. 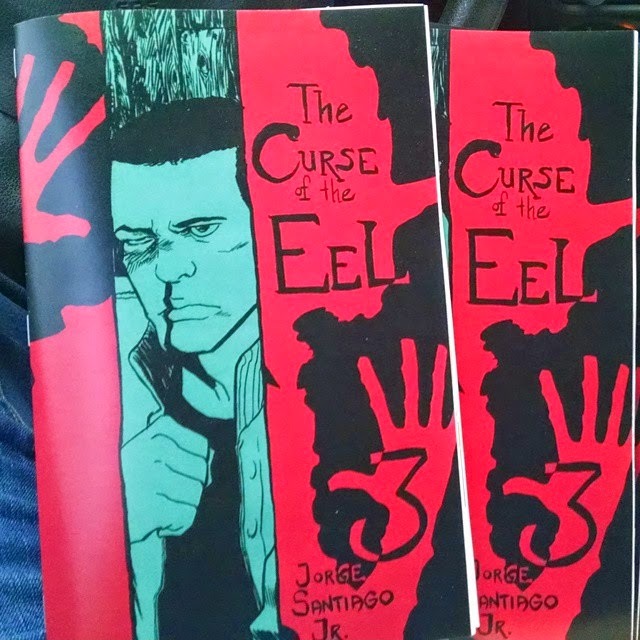 If you'd like to read the first chapter of Curse of the Eel, click here! If you'd like to buy the first 3 chapters, I have some copies available here. D is for Delilah! She is off the chain, mainly because she's strong enough to break it and beat people up. She's an old character from my first series of graphic novels, the Wolves of Sariel. The Wolves were a sect of religious vampires who tried to only hunt people that were criminals or up to shenanigans. They saw themselves as the wolves who protect the sheep, rather than hunting them like others would. 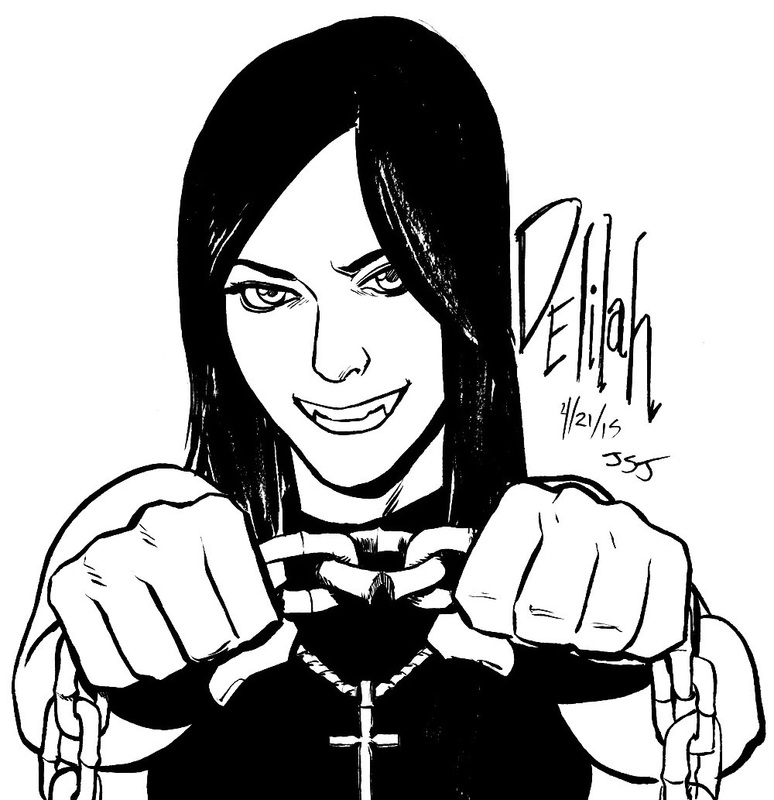 Delilah was a vampire who often clashed with her elders because she didn't believe in living a life where you monkishly give up everything for the sake of some religious clarity. Delilah was a child during the Japanese Internment in WW2, so she doesn't want to feel like a prisoner or a nun. She wants to live and eat and have fun and bring the pain to people who cross her. Unfortunately she was in a part of the book I didn't get to draw, but should I ever revamp Wolves, she would definitely be in it. C is for Connie, and continuing on with the A to Z character challenge thingy is the goth girl who was the focus of my Thesis. Connie is an introverted high school student with more books than friends. I think she has... 1 friend. And that friend is an Eldritch like creature she summoned in an abandoned cult house by accident. Curse of the Eel is a high school comedy drama with a splish splash of Lovecraft inspired horror, where the ever changing Eel is not the scariest monster to be lurking the halls of her high school. Here is a link to the first chapter and the first book is still available in my store although I'm running short on copies. B is for Bellona! Continuing on the A to Z thingy I started yesterday, which I hope the people who read this are enjoying it as much as I am! 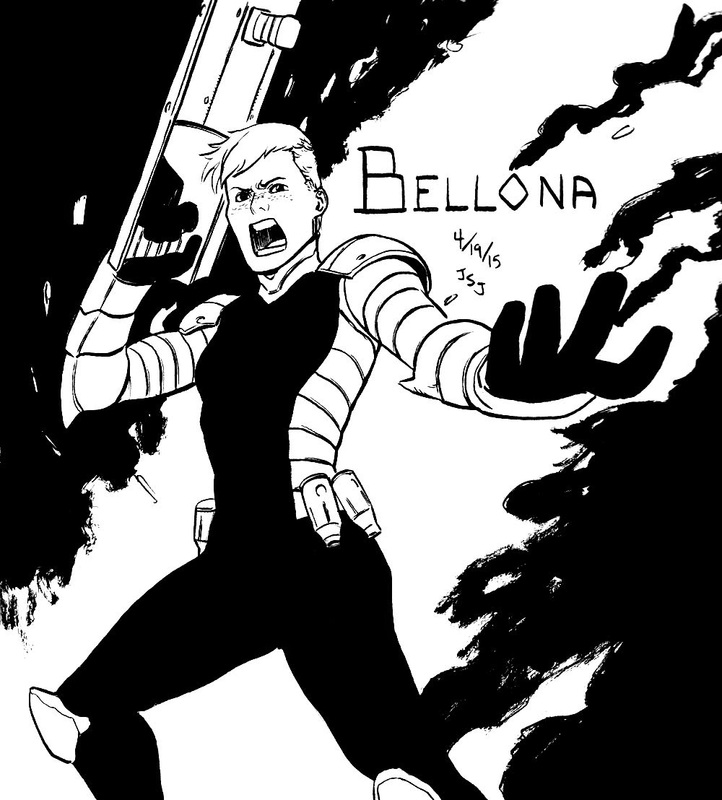 Bellona is a character from my story Hybrid Ghost, an update of the old "Hibrida Prima" comic that is lost in the dusty hallways of this blog. The updated story focuses on espionage and diplomacy. After decades of long brutal fighting, a tenuous peace has been established, but like any real conflict, not everyone is done hating and fighting. Bellona's father was a soldier for the humans and he was stolen away from her when she was very young. She holds a grudge against all aliens but especially the one who is responsible for ruining her family life. Bellona is half Irish half Hispanic and is a strong boorish woman with no empathy for anyone who doesn't have roots on Earth. She is a main figure and villain in the story by the halfway point and she is one of my favorite characters to write because villains are oh so INTERESTING! I'm not giving a ton of detail here but I hope that sounded at least somewhat interesting. 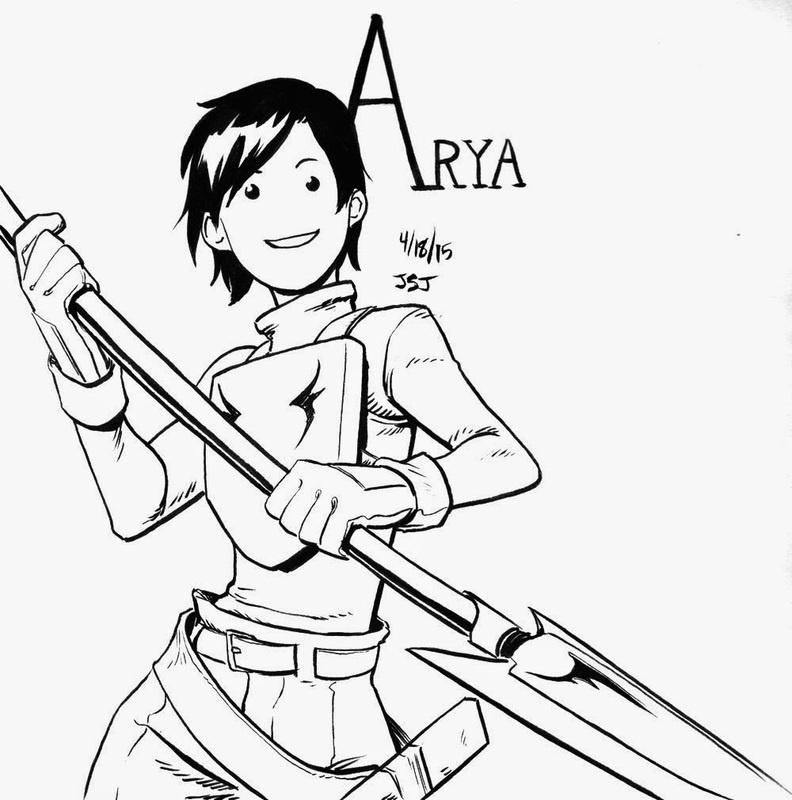 Arya is one of the main characters of my fantasy comic, Rare Drops. Arya goes on adventures to find rare treasures and generally just enjoy life! Check out the first chapter here, The Ice Cave. Or you can purchase the comic here in my Store. I'm going to try to make a new post everyday with a drawing of another character of mine whose name begins with the next letter of the alphabet. Tomorrow is B! When it's complete, I may compile them all into a sketchbook to sell here and at cons. Drawn in my Stillman and Birn gamma sketchbook, although I had to remove the lovely cream color in clean up. Guess who has new books! No it's me! I'll have these 2 for sale, as well as other comics for sale at Fluke in Athens, Georgia tomorrow! Come by if you like, and any unsold books will be added to my bigcartel store after the show! I'll also be doing sketches if anyone would like one, so if you're a fan of my sketches of the day and are in the neighborhood, come on by! 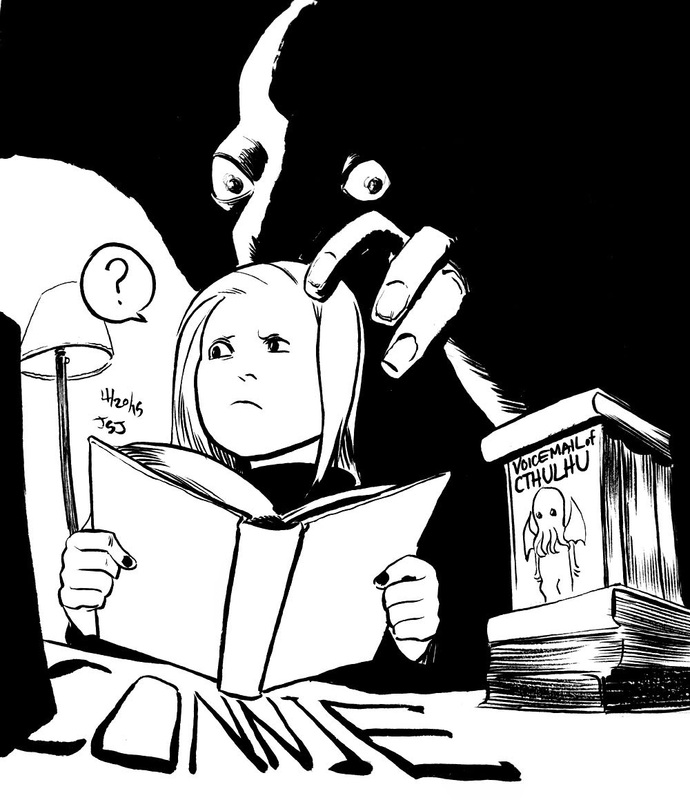 Curse of the Eel is about a goth girl named Connie who is being terrorized by bullies. One day, seeking shelter from them in an abandoned house in the woods, she accidentally summons up an Eldritch-like Eel creature that is like the monsters she has loved to read about since she was little. Can the Eel make her life better, or is it just another nuisance that Connie has to put up with every day? 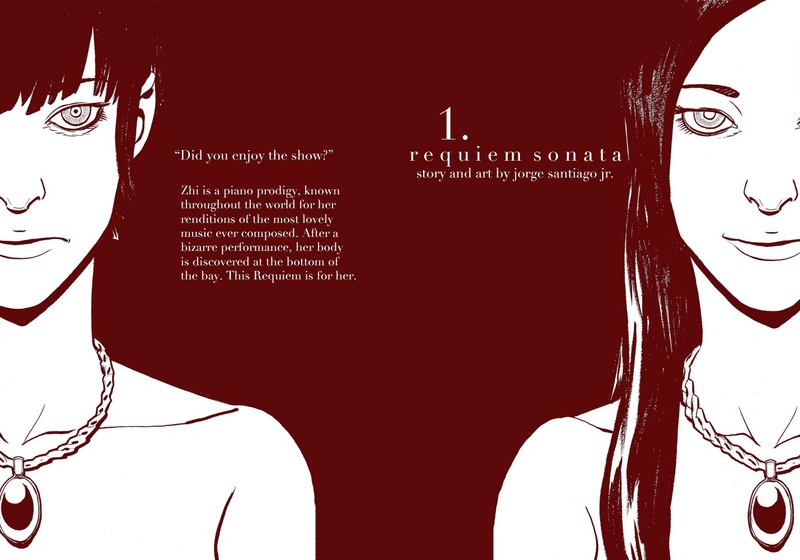 Requiem Sonata is about a famous classical pianist named Zhi. She has traveled the world playing Mozart, Schumann, all of the greats and she is loved for her skills. After a bizarre performance, Zhi's body is found at the bottom of a bay. Detective Simoné, an ardent fan of Zhi's, takes up the case to discover why her favorite musician died. This is today's warm up drawing, and I think it turned out pretty well. I'm a big fan of the show so it was easy to think up this idea, which honestly, there's not much too it. Although I think this has all of the stuff I tend to do well with. 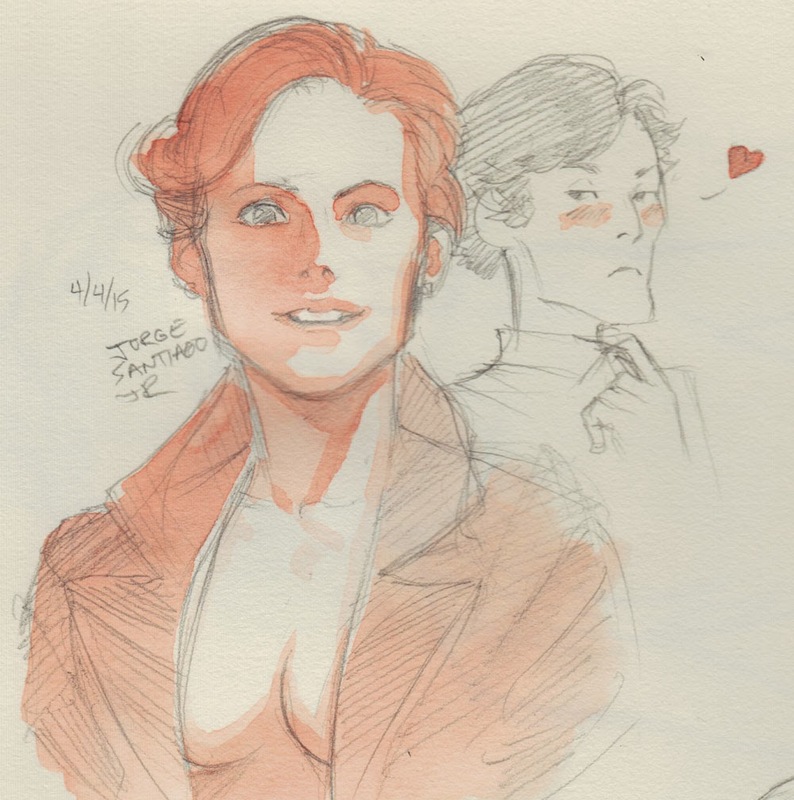 I really liked using a caricature for Sherlock to show that he's a little turned on. 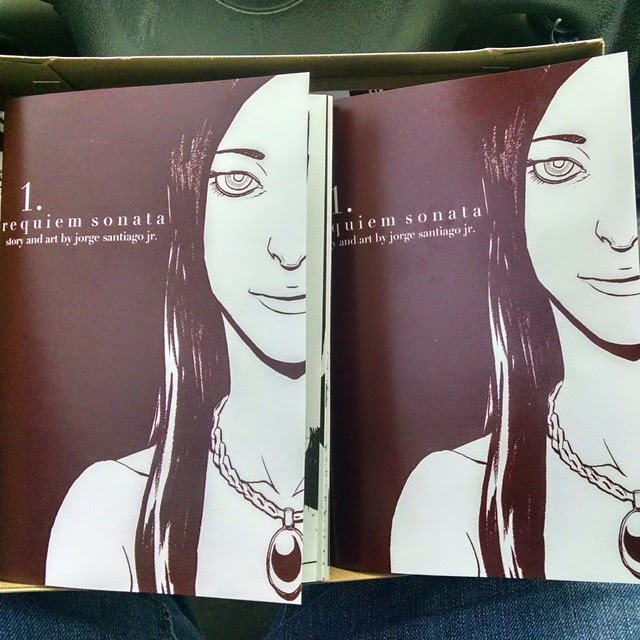 I recently finished the first chapter of Requiem Sonata after taking a short hiatus form it. 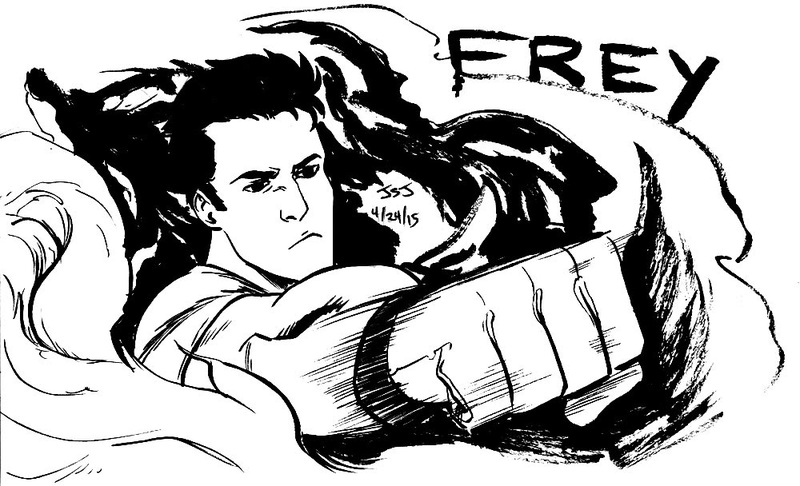 Life has been lifelike but I'm ready to drop back into the regular groove of comics again. So here's my process materials for the cover! Zhi is a troubled young pianist and often times what she says, what she does, and what her face telegraphs are contradictory. In order to get that across, I wanted to display on the cover the various facets of her personality. I then split the two in half to create this awkward cuts for the cover. Why use them if they're awkward? Because I want the reader to feel like something is wrong, get them feeling like something is false in her expression. I believe that there are "rules" to good illustrations, but I think breaking those rules can be just as effective. Yeah, I'm punk like that (not really). To deal with the uneasy feeling of the actual art, I decided to go with simple text and one color to make it very easy to read. I think what could be damning for a cover like this where I'm trying to show unease is having something overly complicated that just makes the art look like I don't know what I'm doing. By making the cover this simple, with all this negative space and having one color, everything feels more deliberate. I hope so at least. I chose a duotone for the cover because honestly, I love it! I love black and white images and swapping out the black for a color changes so much about the image in infinite ways. In the original inks, she's just there, but with this desaturated red-brown, it conveys a lot more about the tone of the book than just a simple black and white image. I will do covers like this whenever possible, mainly because I prefer simple images to convoluted ones. I like a cover with fancy details and all that, but a cover that evokes the spirit of the book will always win out to me over something that is just a technically sound but emotionally hollow image. I wrestle with this a LOT in my comic covers, they're the hardest part for me, and sometimes I strike gold. But even if this is fools gold, I'm happy to be tricked by it. Thank you for reading! I hope it was informative, I want to do more process posts like this so leave a comment if you liked it, share it too, and consider following me if you have a blogger account! Either way, thank you! EDIT: I got some feedback from my friend Celin, and made some changes to the text on the back cover. I moved all of the social media stuff to the last past page of the book. Thank you for the advice! Tools: Zebra Fine Brush Pens, Copic Multiliners, and the Pentel Color Brush.